A split-screen photo published by CNN and coded as a “neutral” photograph for both men. Both men are in the middle of speaking. Note further similarities in the angle of the men’s heads, their gaze, even their shirts. The most significant difference is the background. CNN repeatedly published this exact split-screen photo: on Sept. 17, 18, 23 and Oct. 1, 3, 15, 16 (twice), 17, 21. The top photo, from Fox News, ran on Feb. 26, 2012, the bottom on Fox News on March 14. Note the difference in impact when a flag is in the background. Note too the difference when the candidate is gazing upwards, as in the bottom photo, rather than level at the viewer — even when the candidate has a serious expression in both photos. Coding photographs is not an exact science. The multi-part coding for each of the over 8,000 images* pinned to Pinterest included criteria both objective (e.g. ‘who is pictured in the photo’) and subjective (e.g. ‘is the candidate treated positively or negatively’). 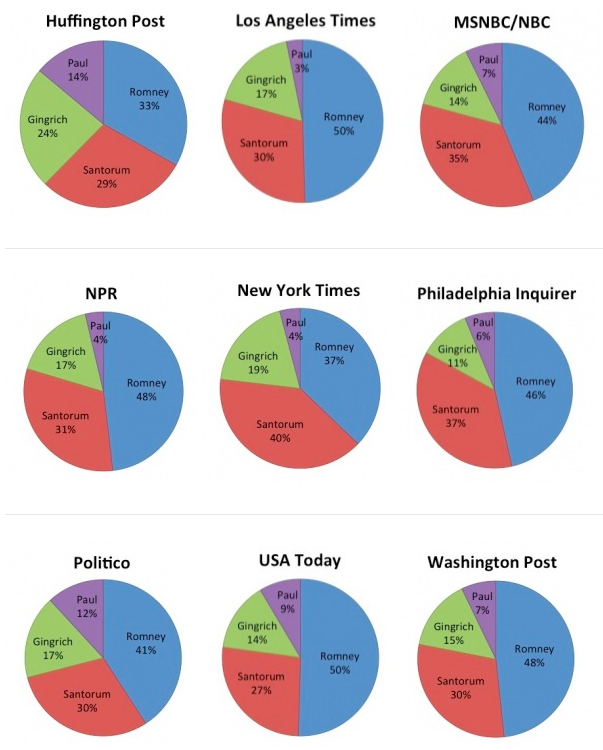 This study’s value is in the quantity of images assessed across 21 online news outlets over four months of the 2012 U.S. presidential campaign. The researchers who evaluated the photos received training in coding images, and even given the inevitable subjectivity of some of those measurements, the consistency of the survey mechanisms identified strong trend lines. Those trends are identified throughout this study website. For a sampling of photos coded by researchers see the photos below of Gov. 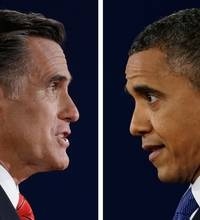 Romney and Pres. Obama. Researchers coded these photos with five rankings: very negative, slightly negative, neutral, slightly positive, very positive. The positive-negative ranking was arrived at via researchers coding such visual elements in the photograph as expression, gaze, number and type of people in the frame, camera angle and camera distance. Note: When news outlets published split-screen photos of the candidates, the photo was pinned and coded twice: once for each candidate pictured. All the photographs below come from the hundreds of images pinned from Fox News during the general election campaign in September and October 2012. Clicking on the images below connects to the photo’s Pinterest location. * NB: The total number of photos pinned to Pinterest over the course of the primary and general election study is close to 9,000. The total listed at the top of the PrezPix Pinterest homepage is a subset of that number. That pin count reflects only the number of pins added directly through the PrexPix account and does not include pins from researchers on group boards. 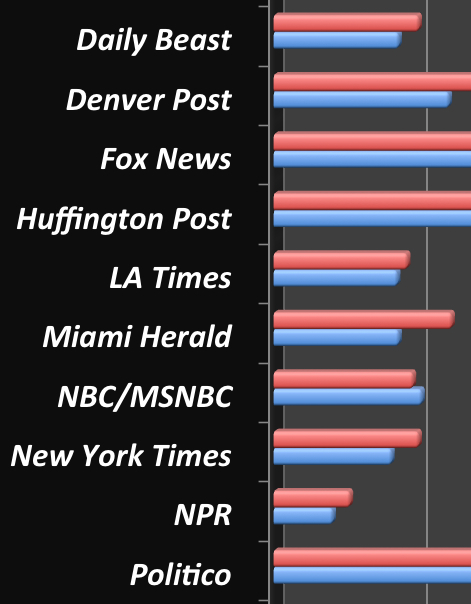 Researchers applied the same collection methodology for all the news outlets studied. It is likely that the researchers on this survey did not collect every photograph published, and, on occasion, certain photographs that could be viewed were not collectible by Pinterest. The total number of photographs studied, therefore, should be understood to be representative of those published on the news outlets, not an absolute set of all photographs published on all sites.